I don't doubt that the principle of deriving banners of arms from coats of arms would apply to the coats of arms of Guernsey parishes. However, I am not aware of any Guernsey parishes which use banners of arms. GUERNSEY’S new £19.5m. airport terminal was officially opened yesterday. Carrying out the ceremony, the Bailiff, Sir de Vic Carey, said he hoped those who had driven the project through would be remembered for their foresight and wisdom. Primary school pupils raised the 10 parish flags to a ceremonial fanfare from the Guernsey Concert Band. Now we "just" have to find them. I found a photo showing British and Guernsey flags and all 14 local flags of Guernsey. That means 10 parishes, Alderney, Sark, Herm and Jethou. 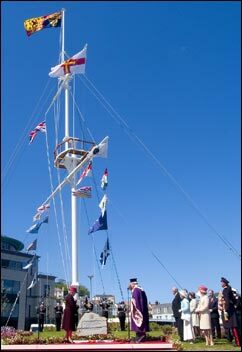 On the BBC's web site may be seen another picture of the same location, from a different angle, showing the Royal Standard at the very top of the mast and The Queen standing at the bottom of it (she is the lady on the left: it looks as if the mast is coming out of the top of her head): http://www.bbc.co.uk/guernsey/content/images/2005/05/17/hrh_sea_guernsey_mast_tim_feak_242x352.jpg, on the occasion 09 May 2005 of her unveiling of a stone at the bottom of the mast on Liberation Day, marking the sixtieth anniversary of the liberation of Guernsey from German occupation at the end of World War II. 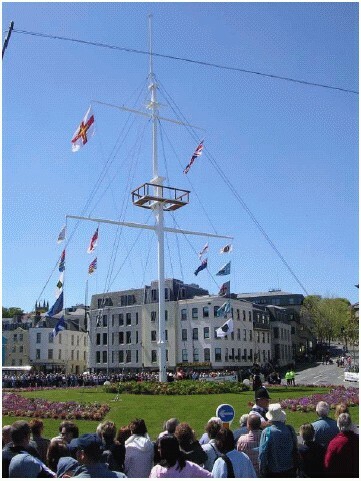 There is also this diagram of the mast: http://www.bbc.co.uk/guernsey/content/images/2005/04/13/flag_mast3_180x300.jpg together with further information regarding the purpose of the mast on the same web site. 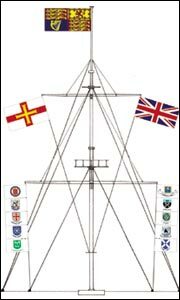 However, there are no further close up photographs of the smaller flags under discussion on the same web site, or those to which they are linked. One further Guernsey related flag matter, probably unconnected. During April and May of 2003, there was an artist in residence at eight Guernsey schools whose theme was "to work on flags of the island adopted by schools." There is no indication as to whether the two events are connected. Another image of this mast with more detail can be seen at http://commondatastorage.googleapis.com/static.panoramio.com/photos/original/19559052.jpg. The ten island crests can be seen at http://image14.webshots.com/15/2/4/11/167120411WgeioU_fs.jpg.